Please use the appointment scheduling system available on the Bartlett.com web site to make an appointment for tree service, or use the contact form to offer your comments. If you'd rather give us a call, our office number is 301-949-4100. 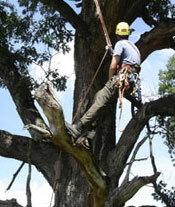 Cabling and bracing are the two most common forms of structural support performed on a tree. Many tree species form tight, V-shaped branch forks or split crotches. When there is a small angle between branches, there is a weak union. As the branches grow, bark is pushed against bark. This bark between branches is called “included bark.” Branches with included bark between them cannot have a strong union of wood fiber. As they get larger and heavier, they become susceptible to splitting. When a tree is young, the V-shaped forks can be removed and given time the tree canopy will fill in. On mature trees with large limbs, removing the least desirable leader or branch might be the answer in some situations. However, if removing such a limb will leave the tree lopsided or unsightly, the proper installation of cables is the answer. Flexible cables or rigid rods reduce the chance of failure on defective structures during high winds, storms or from the weight of new growth. Cabling connects two limbs to each other by means of extra high strength steel which will provide equal support to both branches. Cables should be taut but not extremely tight. A cable installed too tightly will put pressure on the hardware and create tension in the V-fork. Periodic inspections will be necessary to take the slack out of sagging cable. While there are no established rules available on what the average life of a cable is, Wood Acres recommends that cables be checked every time work is performed on the tree.